At 1440 on December 14, 1944, Lieutenant Junior Grade Kōichi Suzuki took off from Cebu Air Base in the Philippines as pilot in a Zero fighter carrying a 250-kg bomb. He was a member of the Kamikaze Special Attack Corps 3rd Kongō Squadron. He died in a special (suicide) attack off Bacolod at the age of 22. After his death in a special attack, he received a promotion to Lieutenant Commander. 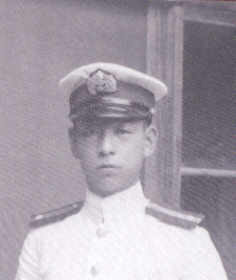 He was from Gifu Prefecture, attended Nagoya Higher Technical School, and was a member of the 13th Class of the Navy's Flight Reserve Students (Hikō Yobi Gakusei). He received basic training at Tsuchiura Air Base and flight training at Tsukuba Naval Air Group. In August 1944, he transferred to Takao Naval Air Group in Taiwan. In November 1944, he joined the 201st Naval Air Group. He wrote the following last letter with a death poem in tanka form (31-syllable poem with lines of 5-7-5-7-7 syllables) at the beginning. The letter was sent from Taiwan and arrived at his home on March 8, 1945. I will go on the road of a young Yamato man of Shikishima . This sentence means that I who will not return will attack earnestly to bury the enemy. That fleeting moment will make my mother weep. My remains will be returned, but my personal effects in the end will not come. I will be buried in an empty white wooden box. Nothing will remain even though I will return. The letter comes from Katabami (2014, 46). The biographical information in the first paragraph comes from Katabami (2014, 46) and Osuo (2005, 167). 1. Both Yamato and Shikishima are poetic names for Japan.